This sugar frosted naked cake offers five tiers in different summer flavours. Each tier is baked, cooled, filled and then chilled until firm, before being brushed with pasteurised egg white and covered with caster sugar. 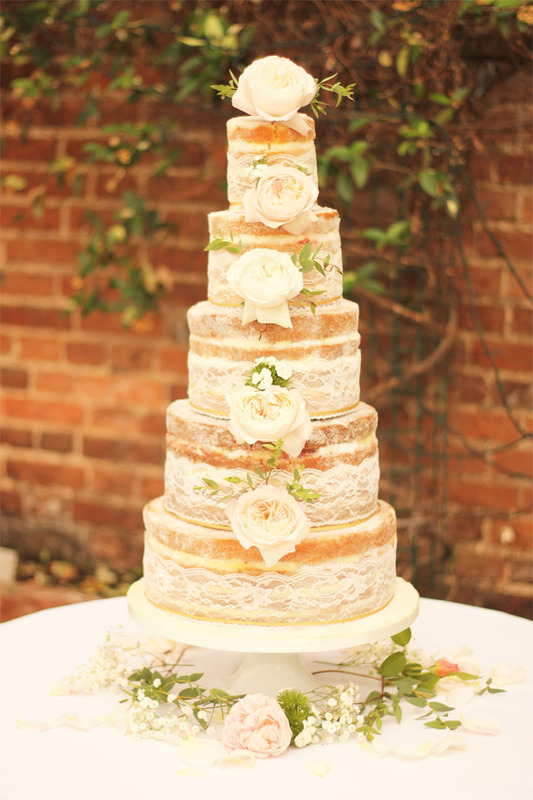 Each tier is wrapped with vintage lace and decorated with fresh garden roses. Semi-naked is the new way to go. 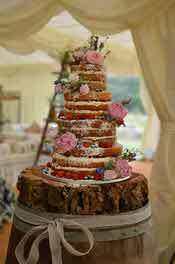 Keeping things moist and tasty, a semi-naked wedding cake works especially well on hot days and offers a more contemporary look. Made for a ‘Wild at Heart’ theme, the masterpiece incorporates cupcakes and all kinds of fresh flowers, corn and olive foliage to match the flower theme. A very cute theme for a wedding: gingerbread and maps. The flowers are made from wafer paper maps and there are lots of gingerbread heart biscuits, iced in pinks and white. 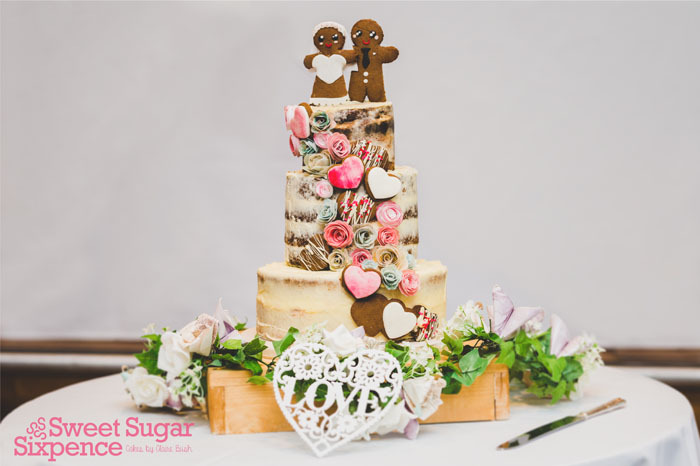 To complement the theme and add even more cuteness, a gingerbread bride and groom sits on top. 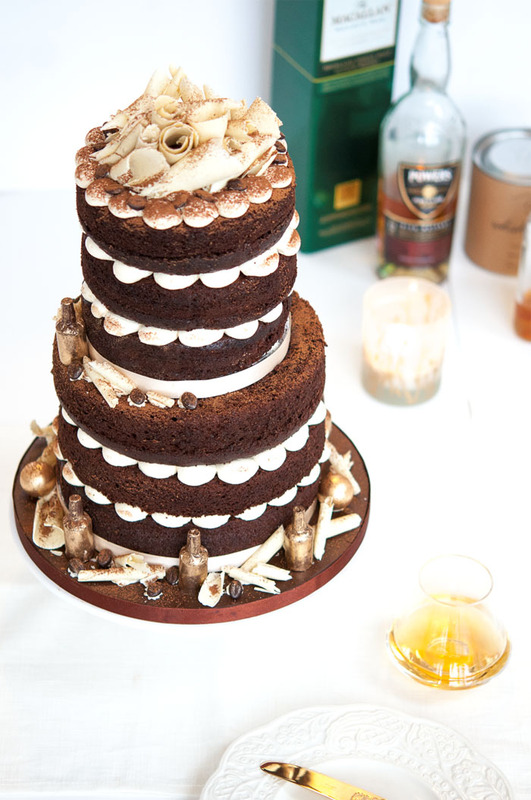 This Irish Coffee naked cake features a whisky/coffee spiked rich chocolate sponge, sandwiched together with a creamy Irish coffee infused buttercream. Dotted around the cake are coffee liqueur bottles, lustred with edible gold and topped with white chocolate curls and coffee chocolate beans. 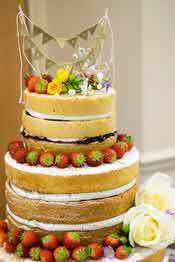 This naked wedding cake is made with a delicious vanilla yoghurt sponge that stands up beautifully on display for the whole of your wedding day. The recipe method also includes how to make it dairy-free should you need it to be so. 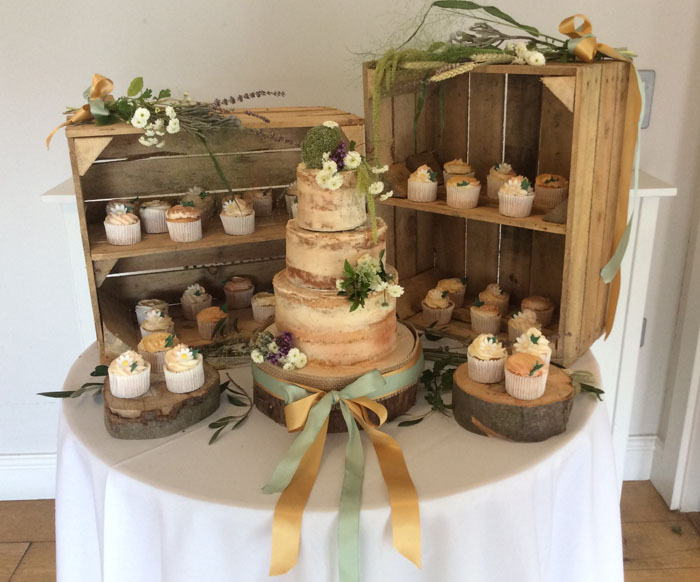 A stunning organic naked wedding cake; a delicious mixture of cake flavours including velvet chocolate cake with Cornish salted caramel buttercream, zingy lemon cake with zesty lemon buttercream and a traditional vanilla sponge with vanilla bean buttercream and jam. 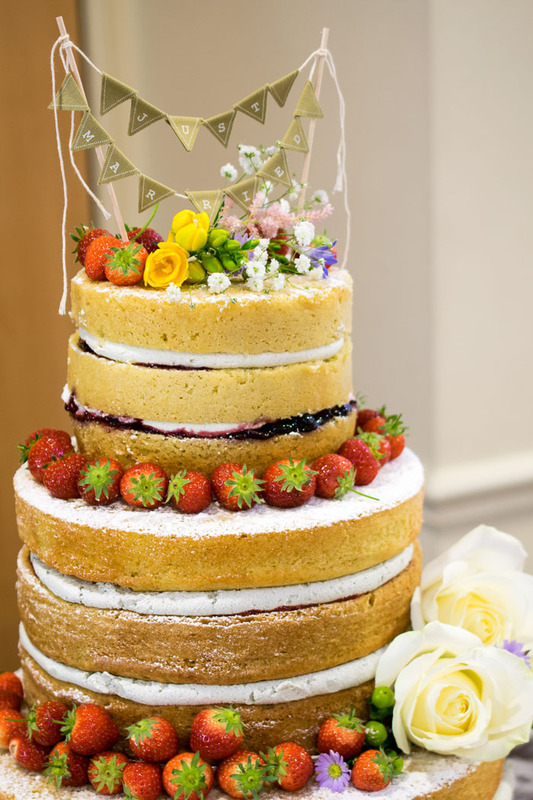 Decorated with summer berries and organic edible flowers from Maddocks Farm Organics. Naked cakes are a modern interpretation of a classic wedding cake without the icing. 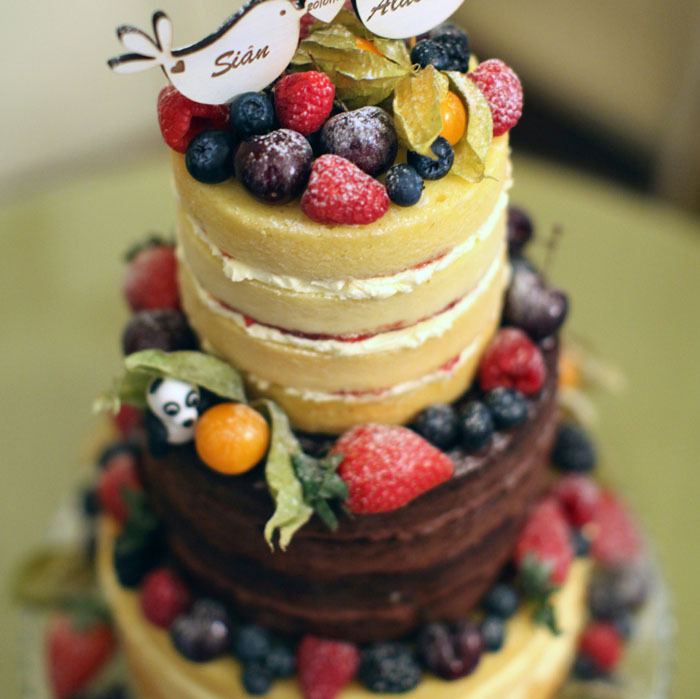 They can be personalised with the bride's flowers and fruit to complement her wedding style. They are made to be moist and fresh with a generous filling. Naked cakes are arranged in as many tiers as the bride chooses. 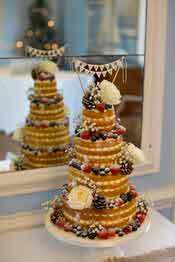 Usually 3-4 tiers. Simple sponge with Madagascan vanilla buttercream and strawberry jam, chocolate sponge with chocolate buttercream, lemon sponge with lemon buttercream and lemon curd. Decorated with seasonal fresh fruit and a dusting of icing sugar, and featuring a tiny sugar panda hidden among the fruit. 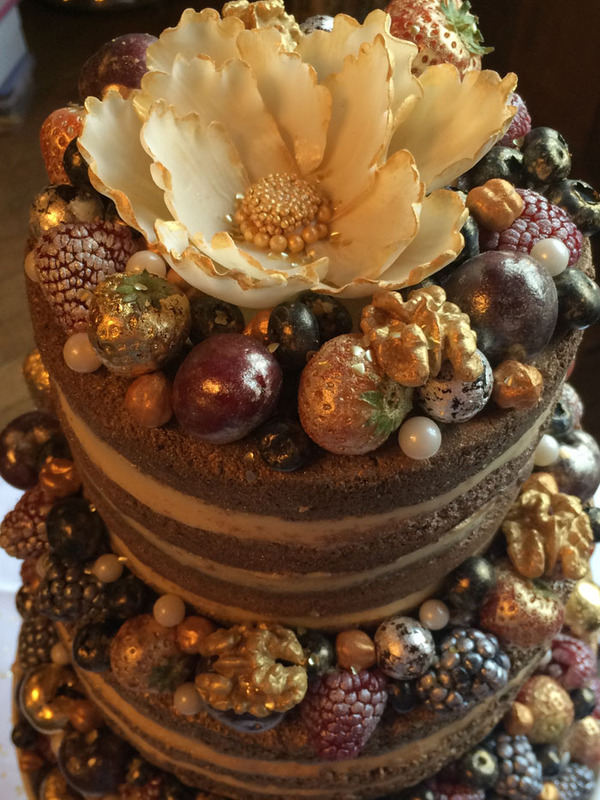 This sumptuous dark naked cake is adorned with fresh berries covered in edible 24ct gold leaf, silver leaf and edible lustres. The three tiers are a combination of chocolate cake, carrot cake and rich fruit cake layered with marzipan. 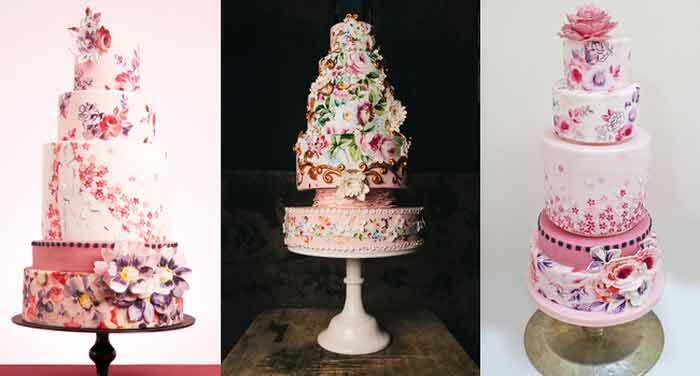 The flower is hand-crafted and completely edible. 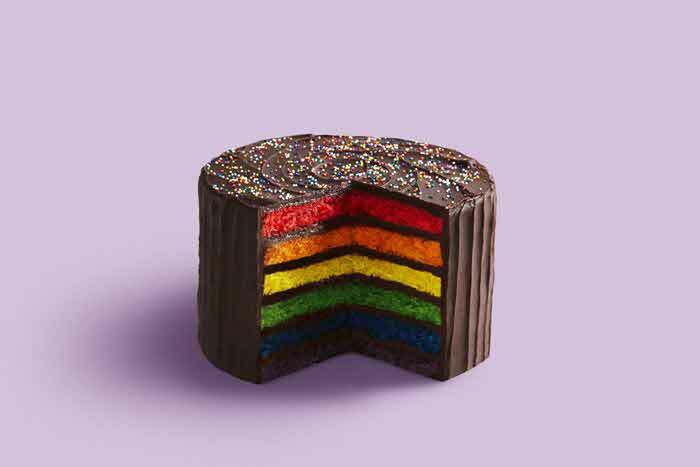 This cake was created for Adam and Leanne Griffiths in November 2015. 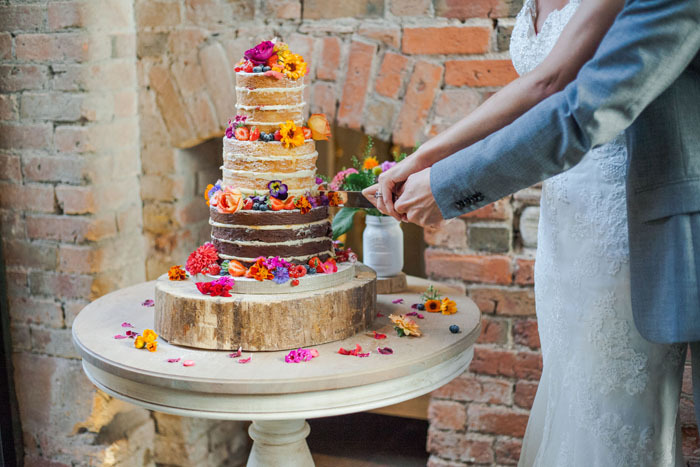 Leanne wanted a lovely naked wedding cake for their big day, but rather than the more commonly seen messy style she wanted a more clean and put together look, so the buttercream was piped between the tier instead. 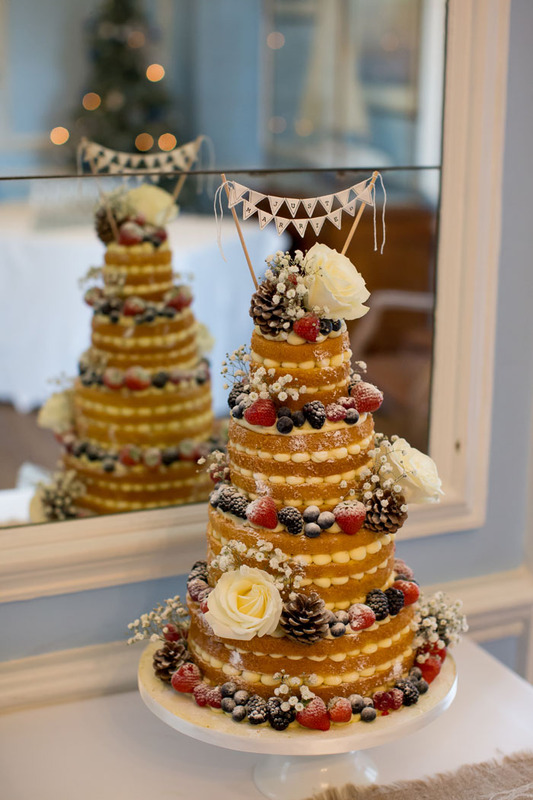 Dressed with super tasty fresh fruit, beautiful fresh blooms and large pine cones for a wintery seasonal look, the cake came out perfectly.